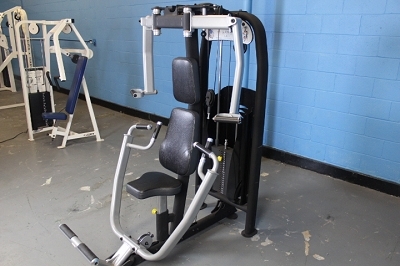 This Freemotion Chest Press gives you more options for working out your chest. Featuring duel handles and swiveling pulleys this chest press has no ridged motion path, allowing it to easily be used for flat, incline and decline styles of chest press with no adjustment. Remember, shipping isn’t included in the price, and there are two options. First is having it shipped to you, and the cost of that will be calculated based on your zip code before you check out. Second is choosing local pick up, which means you will be coming to get yourself from our warehouse during open hours and you don’t have to pay us for shipping at all. Even better, want to try everything out yourself? Come and see it in person! Our 65,000ft warehouse is laid out for you to come and play on all of the thousands of awesome fitness equipment products in stock!